Read: "Up to 3,500 MB/s"
Write: "Up to 3,200 MB/s"
Max Random 4K R/W: "480,000 / 550,000 IOPS"
The ultimate in performance, upgraded. Faster than the 970 EVO, the 970 EVO Plus is powered by the latest V-NAND technology and firmware optimisation. It maximises the potential of NVMe bandwidth for unbeatable computing. The 970 EVO Plus reaches sequential read/write speeds up to 3,500/3,200 MB/s, up to 53% faster than the 970 EVO. The latest V-NAND-which brings greater NAND performance and higher power efficiency-along with optimised firmware, a proven Phoenix controller and Intelligent TurboWrite boost. The new standard in sustainable performance. 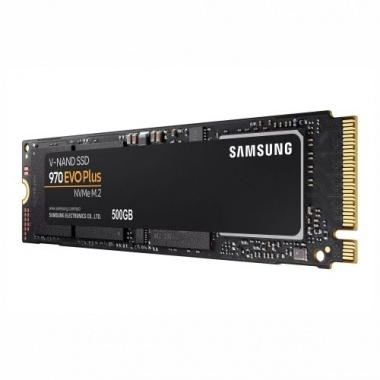 The 970 EVO Plus provides exceptional endurance powered by the latest V-NAND technology and Samsung’s quality.